New Brunswick, N.J. – Recently published results of a phase 2 clinical trial have shown the best outcomes to date for newly diagnosed older Hodgkin lymphoma patients treated with brentuximab vedotin given before and after doxorubicin, vinblastine and dacarbazine (AVD) chemotherapy, which is the standard of care. Causes of poor outcomes for older Hodgkin lymphoma patients are not well understood although inability to tolerate full doses of chemotherapy, the existence of co-morbidities, disease biology and other factors have often been attributed. The aim of this multi-center, investigator-initiated study was to improve outcomes for this difficult to treat population. Results of the work were published in the September 4 online edition of the Journal of Clinical Oncology (doi: 10.1200/JCO.2018.79.0139). “Historically, survival rates for older patients with Hodgkin lymphoma, typically defined as 60 years and older, have been shown to be disproportionately and markedly inferior compared with younger patients. Compounding this has been the underrepresentation of older Hodgkin lymphoma patients in clinical trials over the past several decades. 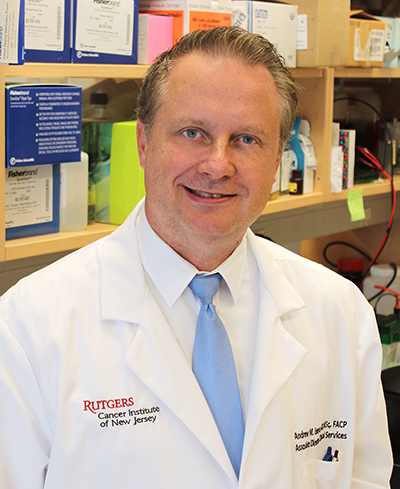 In this current study, the survival rates are among the best reported compared with prior Hodgkin lymphoma studies,” notes Andrew M. Evens, DO, MSc, FACP, associate director for clinical services and director of the Lymphoma Program at Rutgers Cancer Institute of New Jersey, who is the lead and corresponding author of the work. The overall response rate to the initial brentuximab vedotin lead-in dose was 82 percent with a complete remission rate of 36 percent. After first-line chemotherapy was administered, the overall response rate and remission rates were 95 percent and 90 percent, respectively. “Overall, therapy was well tolerated when compared with other analyses studying similar patients. These data will be practice changing for our field,” adds Dr. Evens, who is also the medical director of the oncology service line at RWJBarnabas Health. Additionally, the two-year progression-free survival rate was 84 percent with an associated overall survival rate of 93 percent on intent-to-treat analyses. In addition, baseline assessment of geriatric measures including activities of daily living and presence of co-morbidities was strongly prognostic for patient outcome in this study. “Importantly, this regimen was well tolerated, eliminating bleomycin to avoid pulmonary toxicity and with only 4 percent of patients experiencing grade 3 neuropathy, compared to 27 to 33 percent in other frontline brentuximab vedotin studies in older patients,” adds co-senior author Paul A. Hamlin, MD, medical oncologist and member of the Lymphoma Service at Memorial Sloan Kettering Cancer Center. “This clinical trial was conceived among investigators at the Robert H. Lurie Comprehensive Cancer Center of Northwestern University when Dr. Evens was a faculty member here along with collaborators at Memorial Sloan Kettering Cancer Center, Stanford University, MD Anderson Cancer Center, the University of Chicago, Tufts University and the University of Nebraska,” shares Leo I. Gordon, MD, FACP, director of the Lymphoma Program and the Abby and John Friend Professor of Cancer Research at Lurie Cancer Center, who is a co-principal investigator on this study. “It represents an important collaborative effort among major academic medical centers studying Hodgkin lymphoma,” adds Dr. Gordon. The authors do note study limitations including the inability of some patients to complete therapy as planned (23 percent did not receive the prescribed six AVD cycles; 48 percent did not complete brentuximab vedotin consolidation cycles). With that, they say strategies to decrease the length of the therapy, either through individual drugs or number of cycles administered, should also be explored. Along with Evens, Hamlin, and Gordon, other investigators include Ranjana H. Advani, Stanford University; Irene Helenowski, Northwestern University Feinberg School of Medicine; Michelle Fanale, University of Texas – MD Anderson Cancer Center; Sonali M. Smith and Borko Jovanovic, University of Chicago; Gregory R. Bociek, University of Nebraska; Andreas K. Klein, Tufts Medical Center (Boston); and Jane N. Winter, Northwestern University Feinberg School of Medicine and the Robert H. Lurie Comprehensive Cancer Center.